Word for Today: Christians should have contentment. 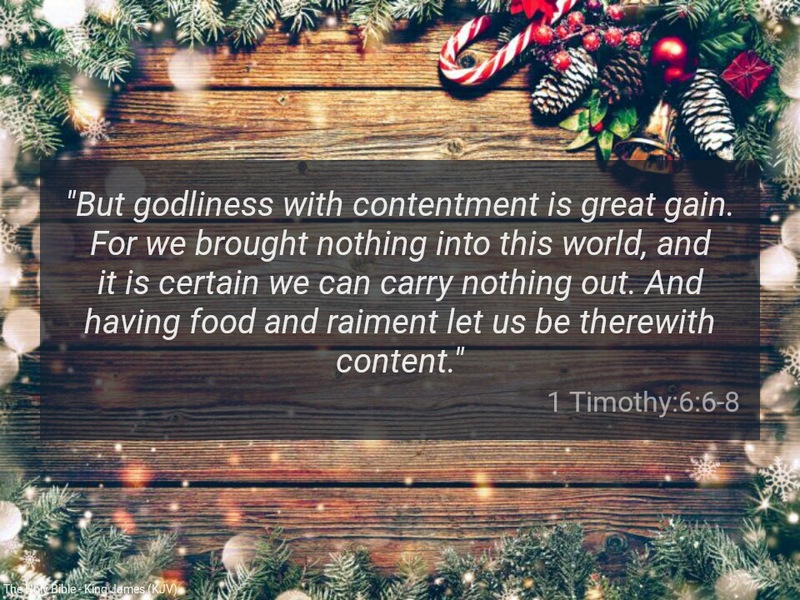 “But godliness with contentment is great gain. For we brought nothing into this world, and it is certain we can carry nothing out. And having food and raiment let us be therewith content” (1Timothy 6-8). There is wisdom in being contented with whatever state we find ourselves. I am often surprised that many Christians do not enjoy contentment. Truly, we brought nothing to this world and we shall depart this world with nothing. What ever we have , name them, whether they be qualifications, titles, positions, knowledge, money or wealth, give God glory. Without the grace of God ( Jesus), we are nothing. There is no reason for pride. If you are in good standing with God in Christ Jesus, you have no choice but to share in the divine abundance of the Jehovah El-Shaddai. God’s wish for His children is to enjoy all round prosperity: material prosperity, mental prosperity and spiritual prosperity. The Word says: “Beloved, I wish above all things that thou mayest prosper and be in health, even as thy soul prospereth” (3John 2). “Let them shout for joy, and be glad, that favour my righteous cause: yea, let them say continually, Let the LORD be magnified, which hath pleasure in the prosperity of his servant” ( Psalm 35:27). In Christ, God expects us to be content. The grace of prosperity of prosperity comes from God alone. Remain connected to your SOURCE. Dear Father, please grant us the grace of contentment no matter our situation in Jesus mighty name. Amen. Previous Previous post: Word for Today: Your sins are forgiven! Next Next post: Word for Today: Learn to be a good Listener.